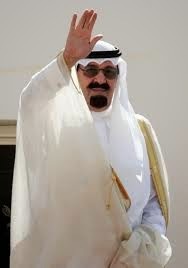 Saudi Arabia's King Abdullah bin Abdulaziz al Saud has just passed away at the age of 90. According to state television, Prince Salman bin Abdulaziz will not take his place as king of Saudi Arabia. Abdullah passed away from complications of pneumonia which he has been suffering from. As Islamic traditions call for, he will have his funeral and burial services done within 24 hours. Many heads of states will visit Saudi Arabia to pay their respects. Vice President Joe Biden will be representing America and will be accompanied by others. Abdullah was one of America's greatest allies in the Middle East and has made attempts to modernized his nation. Considered a moderate, he broaden certain freedoms and used his nation's wealth amounted from oil to fun education and infrastructure projects. He did his best considering he was surrounded by ultra conservatives who often hindered his plans. All eyes are on Saudi Arabia as it makes this transition of power to Abdullah's half-brother. The nations accounts for about 16% of the world's oil, according to statistics from the Energy Information Administration in the United States of America. May Abdullah bin Abdulaziz al Saud rest in Allah's peace. O Allah, surely [name the person] is under Your protection, and in the rope of Your security, so save him from the trial of the grave and from the punishment of the Fire. You fulfill promises and grant rights, so forgive him and have mercy on him. Surely You are Most Forgiving, Most Merciful. Reference: Ibn Majah, Abu Dawud 3/211. See also Al Albani, Sahih Ibn Majah 1/251. Dr. King: Is the Dream Forgotten? Pope "One Cannot Insult Faith"
Be Healthy in the New Year!